Siemens Gamesa Renewable Energy (SGRE), a leading turbine original equipment manufacturer (OEM) in Spain, has secured a new order for the supply of the turbines for Cepsa’s first wind farm, a project with which the Spanish energy player is diversifying its business into the renewables arena. The wind farm, which is being developed in Jerez de la Frontera (Cadiz), will be equipped with 11 of the firm’s G114-2.625 MW turbines for total capacity of close to 29 MW, said a statement. Siemens Gamesa has also been engaged to operate and maintain the facility for five years, it said. The wind farm is due to come on-stream towards the end of this year, it added. Having installed 13,000 MW nationwide to date, Siemens Gamesa is Spain’s number-one OEM, with a market share of over 55 per cent. In addition, the company services more than 7,500 MW of turbines, around one third of total installed capacity in Spain. Specifically, the company has installed close to 2 GW in Andalusia, which is almost 60 per cent of the region’s installed base. Spain is also home to the company’s main research and development (R&D) centre as well as one of its global production and supply hubs, it stated. Earlier, it secured an order from Gas Natural Fenosa Renovables for the supply of 22 turbines to two wind farms being developed in Spain, with combined capacity of 64 MW. Both wind farms are the result of the renewable power capacity allocated to the energy company in the auction held by the Spanish government last May, said a statement. Specifically, the first order encompasses the installation of 15 of its G126-2.625 MW turbines, while the second covers the supply of seven of its G132-3.465 MW turbines, one of its newest models, which features 64.5m-long glass fibre blades, it said. These orders mark the first time both models will be installed in commercial wind farms in Spain, the two prototypes having been validated and certified at the R&D wind farm located in the Alaiz mountain range (Navarra, Spain), it added. Meanwhile, SGRE, one of the leading providers of wind power products and solutions to customers around the globe, has also received orders for two new onshore wind projects in southern Italy. The company is set to deliver 13 SWT-3.0-113 direct-drive units to European Energy’s 39 MW project in Tolve and 10 G97-2.0 MW turbines to a further 20 MW project near Capoiazzo, both wind farms are located in the Basilicata Region in the south of Italy, said a statement. The orders include long term service agreements including advanced remote monitoring and diagnostics, it said. The first wind project is located close to Tolve community eastern to the Italian city of Potenza. The project, owned by the Danish company European Energy, will consist of 13 SWT-3.0-113 wind turbines. The turbines will be delivered in the third quarter of 2018. 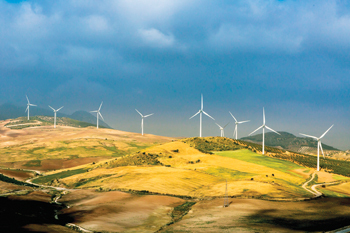 These machines – each rated at 3 megawatts and featuring a 113-meter rotor – provide a highly reliable and flexible solution in the demanding wind conditions of the Basilicata province. Ten units of the G97-2.0 MW wind turbine will be installed at another project site in the Municipality of Capoiazzo in the north-west of Potenza. Owner of the project is a global leader in the renewable energy sector, which already collaborated with Siemens Gamesa in the past. The ordered G97 wind turbines, rated at 2 MW, are equipped with 97 metre rotors and offer an increased power production at an optimal LCoE (levelised cost of energy) under the specific conditions of the site at the south Italian peninsula. The turbines will be delivered in the third quarter of the next year. Italy, a wind energy market with large growth potential, recently issued the new energy strategy for the period 2020-2030 (Strategia Energetica Nazionale – SEN). It is expected to boost the development of renewable energies in the next decade. Overall, the Italian government expects the share of renewables to increase from around 17.5 per cent currently to 27 per cent in 2030. Siemens Gamesa is a major OEM in this market with already nearly 1,600 wind turbines installed with a total rating of over 2 GW, it stated.